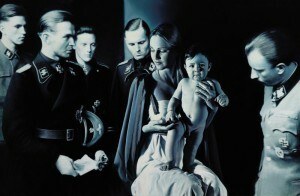 I don't know how often you get to Denver, but the artist Gottfried Helnwein is actually going to be in Denver as part of the "Artists on Art" lecture series. I am planning on being there, Thursday, December 13, 5:30 pm. It is a powerful piece and I have been fortunate to live close by and check it out regularly. It will be sad to see the Radar show close this weekend (7/15/07). I will be writing an article on the show and posting some photos on my blog at denverarts.org.